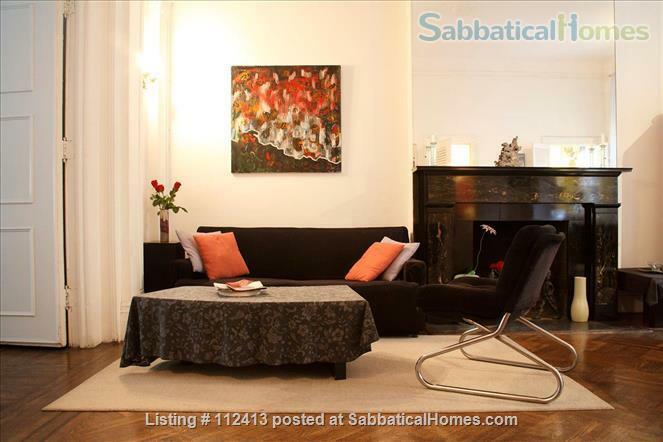 Fantastic, large, 3-B/R (2 available), top-floor, fully-furnished, penthouse live-work apartment five blocks from Union Square in a landmark building. Highly flexible sublet available, two-person or small family maximum. Elegant top-floor penthouse live-work apartment five blocks from Union Square in a landmark, 1922, high-ceilinged, magnificent multi-room apartment with large outside terrace, fireplace, kitchen, washer/dryer, living room, dining room, entrance foyer, 3 bedrooms (2 w/ adjoining shower/bath), hot-tub (unused for 2 years) with 360-degree views of the city and the Bay. This space is offered as a legal sublet of a rent-controlled lease, so you would also be enjoying significant savings for a flexible number (8 to 12) of months per year. You would get without realtor fees or brutal lease requirements nearly all of the fully-furnished apartment. I would occupy the apartment during the periods that you didn't want (and we'd agreed upon) and would be working away those other months during the year. If you wanted the apartment for the full 12-months, you'd be sharing it with my low foot-print presence a relatively small number of weeks per year. Thus, with sufficient advanced notice of months for both parties away, you would only pay full price for the months you wanted to be in San Francisco, and there would be secure storage available for your personal effects while you were away. Term may start any time in early 2020 with no maximum number months, but a minimum of around 8. In other words, you'd have to want at least 8 months on average per year for this to work out effectively. Walker’s Paradise according to www.walkscore.com: 98 out of 100, 100 out of 100 for transit score. DSL Internet (Ethernet and WiFi), free phone, fax, long distance, multi-component entertainment center (no TV, though) plus DVD/HD/Blu-ray projector to 5’x8' hideaway screen, tech-service. Above one of the bedroom closets is a traditional TV w/ remote but no subscriber cable. Each bedroom has a queen-sized or full-sized bed. Payment for utilities: electricity, Internet, and bi-monthly cleaning will be required. Must comply with building’s owner rules/approval and all local laws and ordinances. Only due in full on months occupied, if 30-day notice given to be unoccupied & mutually agreed upon. Both plant care & mail forwarding will be limited, have most everything on-line now. Academically, I hail from two wildly over-priced and notoriously over-subscribed New England univerities that very generously (it was another era) sent this long-ago young man on a decent upward trajectory. Applied thermo would be the best description of my training, and an eclectic set of results from this focus would characterize my professional background. I now live and work in San Francisco, but my private business takes me to the East Coast and the Far East several months per year. I also have an elderly mother cross country whom I visit regularly. I am from the middle of America and speak our dialect quite well. Je parle assez bien le français. Saya bisa bicara bahasa Indonesia sedikit sedikit saja. Mluvím cesky jenom trochu. Looking forward to sharing my home with you in beautiful San Francisco.